Human Rights Watch (HRW) last month issued a report that included a host of accusations against Egypt's government, including attempting to silence dissidents ahead of the presidential election slated for 26 to 28 March. With crackdowns intensifying, do Egyptian authorities perceive a cotton puppet named Fahita to be a critic that has to be muzzled? Apparently the answer is 'yes'. 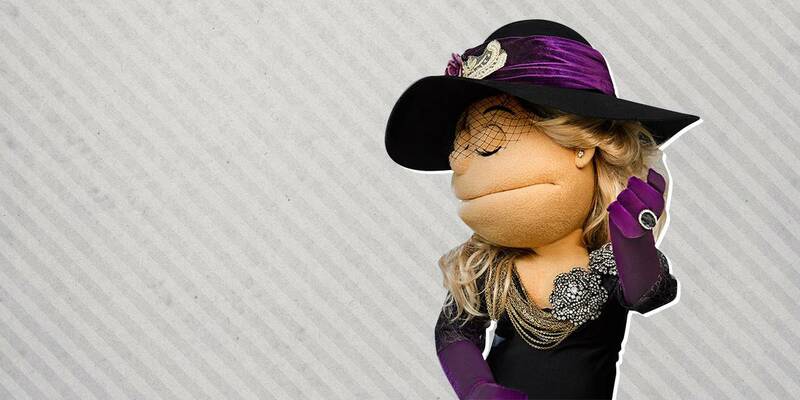 Last week, news outlets -- especially those loyal to the regime -- reported the suspension of the TV show "Live from the Duplex", whose host is Abla (Miss) Fahita the puppet and is aired on Egyptian channel CBC. Beforehand, lawyers, MPs and political proponents of the regime had demanded that the show get suspended. CBC hastened to refute the media reports claiming Fahita's show had been suspended. "The news is false and is based on an anonymous source," reads the channel's statement. The statement also underscored the fact that the suspension news had been reported by a good number of websites simultaneously, adding that "everything that has been published is completely untrue and baseless". CBC stressed that the remainder of the current season would be aired on time without any delays. Fahita's show is hosted at Radio Theater in downtown Cairo, where Bassem Youssef's program used to take place before it was suspended in 2014. In spite of CBC's statement, one of the Live from the Duplex's crew members told Raseef22 the probability the show would actually be suspended was high. The source who spoke anonymously said CBC officials had already insinuated while speaking to the crew that the current season could be the last due to pressure from unnamed bodies. Most news outlets that reported the suspension of Fahita's show cited a formal complaint filed by the Supreme Council for Media Regulation (SCM), the Egyptian governmental body commissioned to regulate media contents. When asked over the phone whether the show will indeed be suspended, Gamal Shawky, the head of the complaints committee at the SCM, played down such a prospect, saying the council did not call for the show to be taken off air. However, Shawky said the council had voiced dissatisfaction to CBC over the show, saying the contents of different episodes were "sexually suggestive and cannot be allowed in a show that is aired by a channel watched in all Egyptian homes". Shawky also said the channel must reveal the name of the person who plays Fahita behind the scene so he or she "would be held accountable when foul language is used". The council's official assured that these regulations are not tantamount to extra restrictions on freedom of expression, which he says the council respects "providing that it is sensible". "Any inappropriate sentences or those bearing sexual implications have nothing to do with freedom of expression," he said. While CBC says it did not receive an official notification from the SCM, Shawky insists that all remarks were sent to the channel in a formal letter. CBC stressed it would carefully follow any instructions communicated by the council. "The creators of the show are psychologically prepared for the suspension decision to come up at any moment, and know pretty well that the channel receives calls every now and then to halt it," said the source from Fahita's show. "Apparently the Egyptian regime has decided that Fahita has to be hushed." Raseef22 tried to reach out to the show's producer Rania Hegazy but she declined to take calls or reply to messages. Live from the Duplex rarely happens to include political implications. And when it does, most criticism would be directed towards the government and not Egyptian President Abdel-Fattah El-Sisi. Yet indeed an episode would hardly pass without sexual remarks or jokes. CBC would add beeps to make such comments less explicit, but on Youtube the episodes are uploaded unedited, which the SCM also opposes. Quite often Egyptian lawyers would file lawsuits against Fahita, the most prominent of whom is Samir Sabry who is closely linked to the Egyptian regime. In December 2017, Sabry filed a complaint at the office of the Prosecutor General, Egypt's top prosecutor, against the whole Live from the Duplex crew, saying the show incited debauchery. The complaint referred to sexually suggestive comments and "inappropriate" words. In 2016, more than one MP called on authorities to hold the show's creators accountable for an episode that, from their perspective, had insulted Egyptian parliament. Also, the SCM's recent spat with CBC was not the first time for the governmental body to take action against Fahita. Last December, it suspended a campaign of Vodafone Egypt that features the famous puppet. The council said the ads included "words and scenes that do not fit public taste, contradict all principles, incite bad behavior and offend public decency, not to mention the low level of the language". The council also decided last February to suspend another program -- SNL in Arabic which was aired by Egyptian channel OnTV -- again over what was described as sexual implications and obscene scenes. Many observers accuse the council of throttling freedom of expression, citing the fact that it keeps suspending shows and ads that turn substantial profits for TV channels. The viewership of Fahita's show, for instance, is high compared to other programs aired on the same channel. It also attracts a decent number of advertisers. Live from the Duplex might not be taken off air should CBC reach an agreement with the SCM. In that case, however, the creators of the show will have to ply their trade within a tighter margin of freedom. The choices will likely be either to produce a show that does not stir controversy, or be suspended. Which way will the creators choose?